sundays are usually pretty busy for us mormons. we get ready for church, go to church, do church callings during and sometimes after church, and we, my husband and i, especially look forward to taking a nap in the afternoon. waking up and getting dinner done isn’t all that exciting either, because you just woke from a nap. a couple weeks ago, our little monkeys were ever so sweet. they have quiet time while we nap, so they can read, write in their journals, or do something quiet. they came in, and said they had a surprise. we walked out of our room, and the dining room table was set, and they had apples, bananas, salad, broccoli, celery, carrots, and bell peppers all chopped and ready for dinner. we had such huge yummy salads and fruit on the side, and they were so happy and felt so great that we were ever so grateful. one of them had chopped all the food while the other sweet girl vacuumed the floor and set the table. eating healthy and having the girls in the kitchen chopping and helping out really paid off! a wonderful woman in our ward makes her own homemade tortillas, pita bread, french bread…all breads… and she was kind enough to come and teach me and some friends. wow, they were yummy! no lard, and gross preservatives and chemicals. just pure deliciousness! i look forward to making and eating these fresh tortillas, instead of the packaged questionable food ingredients and gmo’s that are now in all of our food. we have gone fishing as a family, but jarom has also been taking the girls fishing on dates. the platte river is absolutely gorgeous! we found a beautiful spot on rocks right next to the rapids. what a beautiful, peaceful place! some of these pic’s were taken with an iphone, so please ignore the “noise” in the pictures. we have changed our diet dramatically. after a lot of study, research, and thought, i believe food can heal our bodies. i also believe food can make us sick if we eat enough of the wrong kind. we have hit our month mark of eating primarily fruit and veggies, grains and nuts. the kids only had pizza once with friends, and jarom and i ate out only once, but we ate really healthy. we have had more meals this month than probably our whole marriage, since it requires us cooking and chopping everything for us to eat. our girls have become amazing choppers! not only that, they have had an amazing attitude about the whole thing. it has made me reflect on the word of wisdom, and how it says to eat this way, with meat sparingly. looking at all that is in our food, and how monsanto owns most of the seed out there, which is now gmo, and in EVERYTHING, including our animals, because they eat the gmo seed too. i’m seeing more wisdom in the word of wisdom. even hippocrates new this to be true. is life so busy that we must eat everything from a box or package? are any of us wondering why we are sick and fat as a nation? why aren’t we “preventing” cancer, why are we “curing” it? isn’t that interesting? i’ve read that 90% of diseases can be prevented through our diet. they are even “curing” cancer with strict healthy diets. why don’t we hear more about this, and what is going on with our food being grown, and less about prescription meds, which only mask your problem, never fixing it. something to ponder about. we only get this body once, and believe me, when you have health issues, i would much rather fix the issue than cover it up and feel like this forever. i have also been working with a woman who is doing her phd in water. we have had awful water in the places we have lived. we have well water now, which is much better than city water, except for the fact that we have a lot of naturally occurring uranium from the mountain where they dug the well. well, that can only cause kidney failure along with other problems. so we put our r/o system we have on it. thank goodness for my friend allyn, who is studying water. i never even “knew” what r/o really meant-it cleans all the minerals and nutrients out of your water, leaving it “dead.” so we have been “starving” our cells of hydration whenever we’ve had our system “plugged in” to the main water line. since changing to pure spring water, i’ve noticed a huge difference in how i feel, and also how my skin looks. it’s been an amazing difference! do your research! what’s in your water, is in your cells! make it worth putting in your body. Hippocrates of Cos or Hippokrates of Kos (ca. 460 BC – ca. 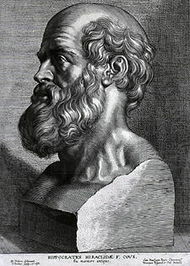 370 BC) was an ancient Greek physician of the Age of Pericles, and was considered one of the most outstanding figures in the history of medicine. He is referred to as the “father of medicine” in recognition of his lasting contributions to the field as the founder of the Hippocratic School of medicine. This intellectual school revolutionized medicine in ancient Greece, establishing it as a discipline distinct from other fields that it had traditionally been associated with (notably theurgy and philosophy), thus making medicine a profession. we have seen so many wild animals, and now we have a black bear that walked through our yard to add to the list! we have elk, deer, fox, turkey, and now a bear. the only thing i don’t want to see that many people say there is up here in the mountains are mountain lions. i’m ok not seeing those! it was a lot of fun surprising jarom on father’s day. we got him a couple of gifts he has wanted for many years! he got a fly fishing rod, and waders that inflate at the top. pretty cool! we were so excited to give his gifts to him, and he was so excited to open them, i think we celebrated father’s day two days early! i love this amazing man! he is an incredible father and husband, i am so very blessed! i’m not the best at having a ton of errands to do…and for two reasons. main reason number 1, i don’t have the energy, and b, i don’t care to spend my life in the car. i’d rather be doing other things with my kids. so i’m the worst at scheduling swim lessons, and will never sign my kids up for soccer that happens every day including saturday! that would be the worst! so thanks to living social, we were able to get a great deal on private swim lessons, yes, only once a week, and yes, it probably would require a lot more than that to get really good, but it will have to do for now! it was a great place, actually a pool where they teach scuba diving! the kids learned a lot and had a lot of fun too, which was the most important thing!